Until the year 1830, the pastors who served this Reformed congregation resided in Frederick, and served this congregation in connection with the one there. The first resident pastor to service the Middletown charge in 1830 was Rev. John Casper Bucher. In 1750, sixty-seven acres of land was purchased by Philip Kefauver, for the benefit of both the Reformed and Lutheran congregations of Middletown Valley. The first building, which was constructed of logs, was used as a place of worship by both congregations and was erected about 1755 on this land which was located about two miles south west of Middletown. This log church was torn down about the year 1776. About the year 1769, the German Reformed congregation left the original union church and built a second log building in Middletown, on the site of the present Christ Reformed United Church of Christ. This second church was occupied jointly until it needed repairing, and then was used as a schoolhouse for some time. A third house of worship, also made of log and built near the present church, was used until the fourth and present brick church was built in the year 1818, under the pastorate of Rev. Jonathan Helfenstein. This Middletown Reformed Church was dedicated on the 27th day of June 1819. 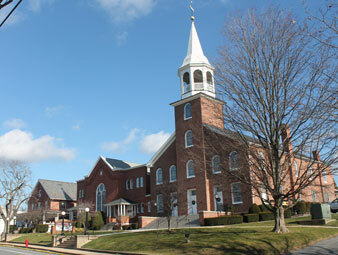 Today, this church still serves its congregation and the surrounding communities in Middletown Valley.